Tadiran Batteries has decided to discontinue the production of our “BEL“ size batteries. This will effect the whole model range of this product which are listed below. Models: SL-840, TL-4986, TLH-4986 and the TL-5186. The replacement we are recommending is our TL-2450 battery and the high temperature version, TLH-2450. Data sheets are available on our website. The TL-2450 is ~2mm larger in diameter, but ~2mm less in height. 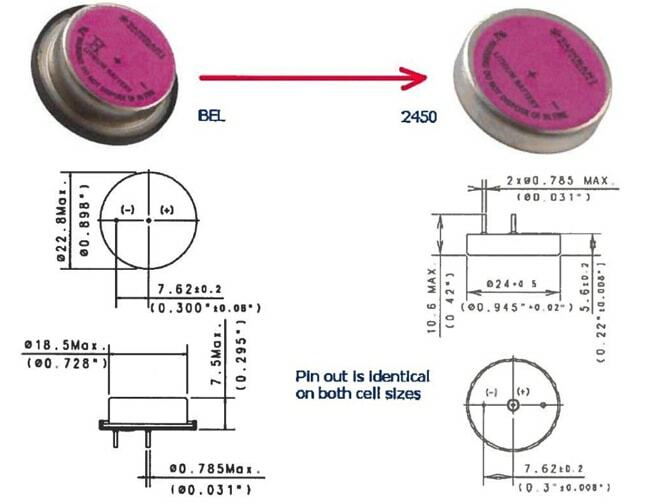 The pin out is identical to the BEL cell and the capacity is significantly higher. Orders for the product range “BEL” types: SL-840, TL-4986, TLH-4986, TL-5186 will be accepted through October 15th 2015 at the latest! For more information regarding this Tadiran discontinuation notice, please contact us.